The Rene Furterer Okara Mask Protective Radiance Conditioner is for coloured hair. Okara Protect Colour Restructuring and protective radiance mask preserves your hair colour thanks to the colour setting properties of Witch Hazel extract. An anti free radical vitamin E and UV filter work to further reinforce your colour protection. Vitamin B5 maintains hair hydration and the Okara protein provides deep down keratin repair action. Your colour is protected, your hair is instantly detangled and it regains long-lasting silkiness and luminosity. 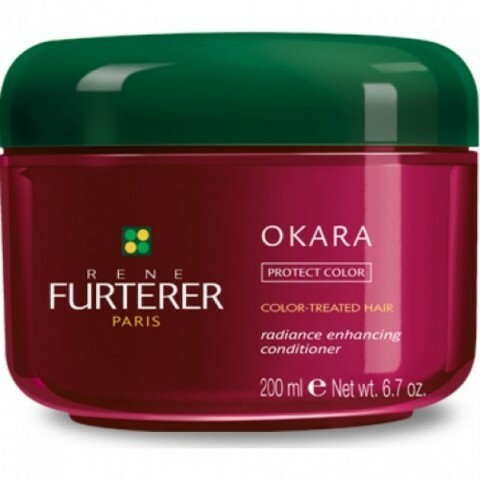 How to use: Apply after Okara Protect Colour Protective Radiance shampoo. Leave in for 3 minutes. Rinse thoroughly.